Description: The "Next Generation" of cable carriers. Uniflex BT features snap-together/hinge opening design, opening from the inner radius, constructed from high strength, fiber reinforced nylon. The new highly versatile Uniflex generation of plastic cable carriers from KabelSchlepp offers maximum performance and value for money. The design gives optimum support to the cables and hoses carried, which together with a choice of either plastic or aluminum profiled shelving systems, ensures the longest possible working life. Noise and vibration is kept to a minimum by means of a double radius control stops and by the design of each link which is refined to limit the polygon effect ('notchiness'). 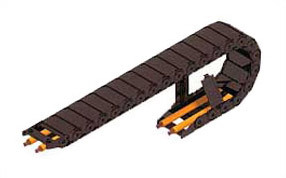 In addition, the new KabelSchlepp chains set new standards for lateral stability and self-support characteristics. The unique yet simple hinge design allows the stays to be opened from either end and, once open, to remain fixed to the link and not fall into adjacent machinery. The hinge mechanism is the strongest in its class, giving a maximum resistance to the bursting forces associated with high pressure hoses. In total, 650 variants of the Uniflex cable carriers are available, with bend radii varying from 28mm to 300mm. All can be supplied from stock with customized separation or shelving systems. Multi-position brackets, with or without cable and hose ties, are available.